In our second week of 2012, not much new music has been flooding in. But there’s always news. And that means a discussion. Word of a new Paul McCartney album, Kisses On The Bottom, due out next month. I’m sure Rolling Stone will sing his praise for months, maybe even put him on the cover. [What else is Wenner doing?] Macca will tour, play the hits. And we’ll all pay big to see a Beatle. Because that’s how that works. New (old?) Van Halen release, with their performance at club Wha? in Manhattan with David Lee Roth’s rejoining to reunite the original 1978 lineup. I’m not sure what this has to do with any of us despite the news has been everywhere. No one can avoid the excitement of a resolved 20+ year feud. February brings us new Dr. Dog, Be The Void, out 2/7 on Whatnot. I had the pleasure of seeing them three times in 2010 – which was excellent. Shame, Shame I will say is my least favorite. I’m an Easy Beat girl. Although it did provide a couple of goodies [‘I Only Wear Blue’ and ‘Where’d All The Time Go?’]. I have a teaser EP of their upcoming release, see what you think below. Word of a tour from Sleigh Bells and a new record February 21st on Mom + Pop, Reign of Terror. You can creep on the new Sleigh Bells single, “Born To Lose” here. I’m not keen on it. It’s no Treats. But we’ll have to wait and see what the whole record brings us. Tennis is releasing Young And Old on Fat Possum 2/14. Produced by Patrick Carney, who cannot seem to shut up about his own crappy drumming which is so far, the biggest turn off of the year. I have to admit that I’m near dreading seeing them at DC’s Verizon Center, our arena. After listening to their most recent World Cafe Live episode you too can hear that none of their live recordings keep time with their records. [‘Lonely Boy’ and ‘Gold on the Ceiling’ are almost in half their recorded tempo. I think we have a confirmed record band.] Carney and Auerbach discuss how they’ll play whatever tempo Pat can keep that day. 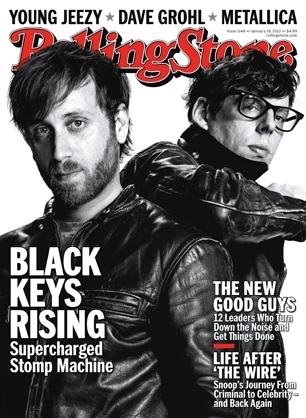 Then you also have their cover of Rolling Stone. [It took AC/DC 33 years to get on the cover, despite being one of the world’s loudest and greatest [most under-rated] rock bands. I suppose a ten year wait for The Keys isn’t bad. But perhaps Carney’s loose tongue is discouraging.] Either way, I’m looking forward to the new Tennis record. what am i gonna do with these guys? Jeff Magnum extended his tour, including Coachella, which is running two weekends this year. Headliners include [surprise, surprise] The Black Keys, Radiohead and Snoopp Dogg & Dr. Dre. Ariel Pink’s Haunted Graffiti is working on a new LP. The classic lineup of Guided By Voices released Let’s Go Eat The Factory, a band I’ve revisited a number of times. I’m not sure I’ll ever get it. The Shins have a new single out, ‘Simple Song.’ Details here. For me, most of this means nothing. I’ve compiled a list of bands who released favorites of mine from the 2011 calendar year that are now touring [and some touring, again.] Highlights include the Dum Dum Girls, coming back to the Black Cat, and Megafaun playing their backstage – both in February. Dr. Dog is playing a pricey night at the 930, $25, in March. But don’t worry. I’ll probably rarely miss their shows ever. Taking chances in going to see aforementioned Sleigh Bells, despite hearing mixed things about their live performances. Expect to hear rants about it here, and rants about The Black Keys’ monstrous blow out with 20,000 of us in tow. Premiering at Sundance this month on the 22nd is Shut Up and Play The Hits, a documentary about LCD Soundsystem’s last days leading up to their Madison Square Garden rager. Hopefully we’ll all come across James Murphy again soon, but I bet it won’t be in 2012. NPR keeps on keepin’ on, as always. Their first listens, for me, have nothing to bark about. But their coverage of world music is nothing to scoff at. VH1 Classic has been airing Metal Evolution, a part of their Rock Doc series. I caught the ‘Grunge’ episode late the other night. More details here. Also on VH1 Classic, That Metal Show is in it’s 10th season. Their 100th episode is coming up soon. Why I started caring about metal? My job, for one. And the other because I’ve recently been a captive audience for VH1’s Classic Hard Rock Songs countdown. Late night TV at work on Friday nights can have you Google-ing the strangest things. Metal is fascinating. Let me remind you of Black Sabbath’s reunion [even with Tony Iommi’s upcoming cancer treatments] and the fact that that they are so psychedelic that no one even noticed. 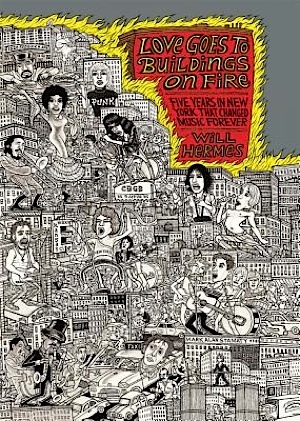 And one last note, if you didn’t get enough of mid ’70s Manhattan from Patti Smith’s award winning Just Kids try Will Hermes’ Love Goes to Buildings On Fire: Five Years In New York that Changed Music Forever. I was sold on it due to Bob Boilen’s genius efforts.